The Palace of Manufactures lies directly east of the Tower of Jewels and fronts on the Avenue of Palms. In architectural design, it duplicates the Palace of Liberal Arts, the repetition giving strength and simplicity to the entire south facade. The dignified main portal is flanked on either side by two minor entrances, similarly conceived and ornamented, the lattice work within the archways relieving the solidity of the design. 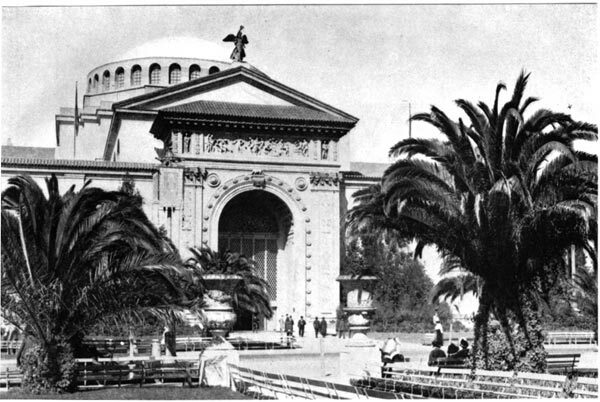 The composition of the Byzantine dome, with its tier of latticed windows, the "Victory" - tipped gable, the tiled slope above the arch, the bare wall spaces and the richly ornamented doorway, as seen from the South Gardens, illustrates the general construction of the main group of buildings. The dome gives height and decorative effect, the "Winged Victory" lightness and grace. The latter figure, which is repeated on the acroteria, as the gable platforms are called, of all the palaces of the main group, is by Louis Ulrich of New York. It bears, outstretched, a wreath which suggests the crown bestowed for work well done.